Not all quarterbacks who make it in the NFL were projected to be starters and stars. Some of them are undrafted signings, or very late picks. 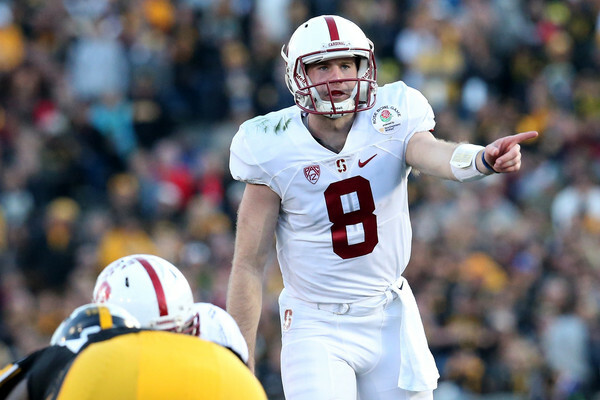 Kevin Hogan might be one of them, getting a lot of interest from teams like the Philadelphia Eagles, Baltimore Ravens, Oakland Raiders, San Diego Chargers, Cleveland Browns, Tampa Bay Buccaneers and Tennessee Titans. That interest doesn’t mean he’ll get picked. If he gets selected sooner than the 6th round it’ll be a shock, but it won’t be shocking to see him try and make his way into the league as an undrafted free agent. But Hogan is intriguing teams. Why? Well, there’s a reason so many teams have either filled up their notebooks about him when visiting the Stanford Pro Day or brought him over for a visit. Hogan won, and a lot. A Pac-12 champion, a Rose Bowl champion. He is an excellent leader, and doesn’t seem to be blinded by the lights of big occasions. That’s not a bad foundation to work with, even if he’s far from the perfect quarterback. Hogan has size and mobility. That’s something to start with. But what needs working? Mostly accuracy and mechanics. His arm isn’t going to become a cannon all of a sudden, so teams and Hogan need to work with what he has. And in order for him to become a useful backup for teams (including those with recently picked star QBs like the Titans and Bucs) or maybe even a starter one day in the NFL, it’ll have to come with his throwing motion getting a massive fix, which isn’t always the easiest thing to change. In four years at Stanford, he’s been to three Rose Bowls, winning two of them. He’s a three-time Pac-12 champion with the Cardinal, and made the All Pac-12 second team last season. He had a fantastic senior season, completing 67.8% of his passes (career best), throwing for 2867 yards, 27 touchdowns and 8 interceptions, by far his best season at Palo Alto. He also ran for 336 yards and six touchdowns.